November 23, 2010 - DHL, the world's leading logistics company, assisted the Boy Scouts of America’s Chicago Area Council with their bi-annual popcorn sale that took place Saturday, November 20th. For the fourth year in a row, DHL Global Forwarding provided use of their facility to store approximately 50 pallets of popcorn and helped a group of Boy and Cub Scouts with the sorting and unloading of the pallets distributed in the North Side of Chicago this past weekend. 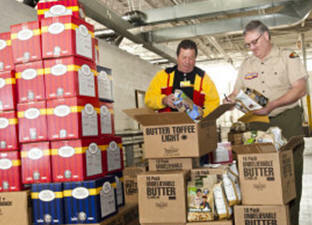 A total of over 2,000 Scouts participate in the fall popcorn sale, but approximately 1,000 Boy Scouts and Cub Scouts participated in the northern Chicago sale and distribution of the popcorn which is used to raise funds. A small percentage of the money raised is used to cover the cost of the popcorn and the remainder goes to sponsoring events for the Boy Scouts throughout the year, in particular, an opportunity to attend summer camp at Owasippe Scout Reservation. Owasippe is the oldest continually operated Boy Scout camp in the United States, celebrating its 100th Anniversary in 2011. The primary goal for DHL Global Forwarding’s Intercontinental Integrated Services (IIS) in North America is to utilize existing warehouse capacity to provide value added services to transportation customers and to bundle this service with other DHL core products to new customers seeking customized solutions. DHL is the global market leader in the logistics industry and “The Logistics company for the world”. DHL commits its expertise in international express, air and ocean freight, road and rail transportation, contract logistics and international mail services to its customers. A global network composed of more than 220 countries and territories and about 300,000 employees worldwide offers customers superior service quality and local knowledge to satisfy their supply chain requirements. DHL accepts its social responsibility by supporting climate protection, disaster management and education. DHL is part of Deutsche Post DHL. The Group generated revenue of more than 54 billion euros in 2008.